The raw translation of the title is "Interesting man be popular now!" 「今 おもしろい男がモテる!」. It seems its a contest to see who can give the most interesting/funny answer. 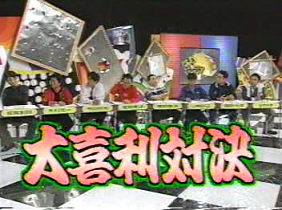 Each cast member picks a cash prize amount from a board then give their answer. 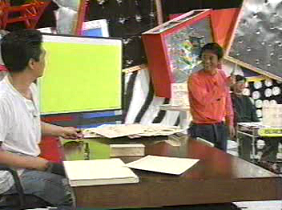 Afterwards Matsumoto must see if he can beat them to steal the prize. Sadly don't have the 2nd part to this that was in Episode #24. Setting: Kansai Region - Osaka. Attempts to try and offend comedian Mr. Miyagawa Daisuke (宮川大助).